Wow. What is happening to Sarah’s hair? And I really don’t think that pink is her color. 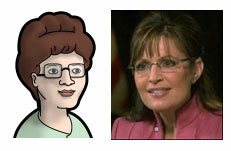 And it’s another Peggy Hill moment. Aside from that the interview was, well, strange. Sarah looked awkward, said we’re headed toward a Depression, looked like a moose caught between the cross-hairs when Katie asked her about Rick Davis receiving all that money from Freddie Mac while he worked as McCain’s campaign manager, and then didn’t know much about John McCain’s track record on fiscal regulation. But she’ll research that! Oh, my. And there’s going to be more. Sarah: Get a new dress! PEGGY: Your mother is one of only sixteen people who have survived parachutes not opening. Now, sixteen is just my estimate. I’ll double-check my numbers later.